SO many of you guys have begged me to keep you in the loop when there's a deal on my bedding and well, it's finally here! first of all i just have to really profess my undying love for this bedding set. it's a quilt, which was a nice change from having a duvet for years. and the quilt is soooooo soft and cozy and snuggly. and honestly the perfect weight – enough to warm you up but not too hot to have on your bed during warm summer nights. it's beautifully made too, i can tell it's going to hold up for a long time. 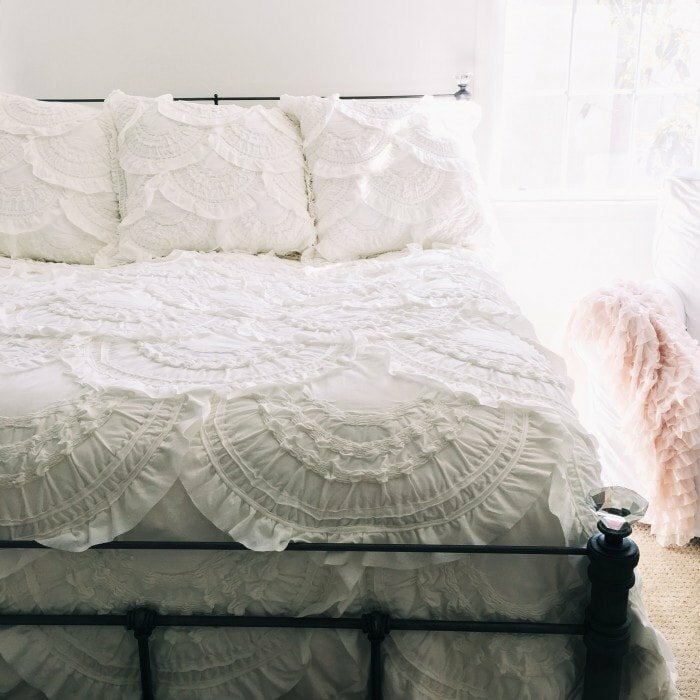 this bedding RARELY goes on sale so if you've wanted it for a long time, NOW IS THE TIME!!! right now all anthropologie bedding is 20% off (no code needed). plus you'll get FREE SHIPPING TOO on any order over $150 (no code needed). AND if that's not enough, be sure to browse the SALE selection because they've recently added new stuff and they're still taking an extra 20% off all sale stuff too with code SALEAWAY. my bedding is not sold in stores but some of their bedding is, and you'll get the discount in-store right now too. no idea how long they'll run this so grab it on sale while you can! Do you have a King bed? Just trying to decide which pillows I want!